The focus of the interdisciplinary focus group Stress and Deformation Over Time (SDOT) is to improve our understanding of how faults are loaded in the context of the wider lithospheric system evolution. SDOT studies these processes on timescales from 10s of Myr to 10s of yrs, using the structure, geological history, and physical state of the southern California lithosphere as a natural laboratory. The objective is to tie the present-day state of stress and deformation on crustal-scale faults and the lithosphere as a whole to the long-term, evolving lithospheric architecture, through 4D geodynamic modeling, constrained by the widest possible range of observables from disciplines including geodesy, geology, and geophysics. One long-term goal is to contribute to the development of a physics-based, probabilistic seismic hazard analysis for southern California by developing and applying system-wide deformation models of lithospheric processes at time-scales down to the earthquake cycle. These deformation models require a better understanding of a range of fundamental questions such as the forces loading the lithosphere, the relevant rock rheology, fault constitutive laws, and the spatial distribution of absolute deviatoric stress. Tied in with this is a quest for better structural constraints, such as on density, Moho depths, thickness of the seismogenic layer, the geometry of lithosphere-asthenosphere boundary, as well as basin depths, rock type, temperature, water content, and seismic velocity and anisotropy. Seismological imaging of crust, lithosphere and upper mantle using interface and transmission methods with the goal of characterizing the 3-D distribution of isotropic and anisotropic wave speed variations. Assembly of 3D lithological models of crust, lithosphere, and mantle based on active- and passive-source seismic data, potential field data, and surface geology. Contributions to our understanding of geologic inheritance and evolution, on faults and off, and its relation to the three-dimensional structure and physical properties of present-day crust and lithosphere. Contributions to efforts of building a 4-D model of lithospheric evolution over 10s of Myr for southern California. Research into averaging, simplification, and coarse-graining approaches across spatio-temporal scales, addressing questions such as the appropriate scale for capturing fault interactions, the adequate representation of frictional behavior and dynamic processes in long-term interaction models, fault roughness, structure, complexity and uncertainty. Modeling approaches may include analytical or semi-analytical methods, spectral approaches, boundary, finite, or distinct element methods, and a mix of these, and there are strong links with all other SCEC working groups, including FARM, Earthquake Simulators, and USR. Development of models of interseismic, earthquake cycle and long-term deformation, including efforts to estimate slip rates on southern CA faults, fault geometries at depth, and spatial distribution of slip or moment deficits on faults. Incorporation of rheological and geometric complexities and such models and exploration of mechanical averaging properties. Assessments of potential discrepancies of models based on geodetic, geologic, and seismic data. Development of deformation models (fault slip rates and locking depths, off-fault deformation rates) in support of earthquake rupture forecasting. General geodynamic models of southern California dynamics to allow hypothesis testing on issues pertaining to post-seismic deformation, fault friction, rheology of the lithosphere, seismic efficiency, the heat flow paradox, stress and strain transients, fault system evolution, as tied in with stress and deformation measurements across scales. Contributions to the development of a Community Stress Model (CSM), a set of spatio-temporal (4-D) representations of the stress tensor in the southern California lithosphere. In particular, we seek compilations of diverse stress constraints (e.g. from borehole or anisotropy measurements) for validation, geodynamic models that explore the coupling of side, gravity, and basal loading to observed geodetic strain-rates and co-seismically imaged stress, and studies that explore regional, well-constrained settings as test cases for larger scale models. Preparatory efforts, including creep law compilations and a database and modeling framework design workshop, to finalize the design criteria for the future Community Rheology Model (CRM), which ideally informs many of the core SDOT priorities. Continued development of the Community Stress Model (CSM) including the development of geodynamic model estimates of crustal stress state. Development of deformation models of the southern California crust that examine the extent to which deformation is accommodated by slip on faults versus distributed, plastic deformation off of the main faults. Contributions of model estimates of fault slip rates in the Ventura Special Fault Study area. Shear wave splitting inferences of mantle anisotropy across the San Andreas Fault. SCEC4 has committed to the development of the Community Stress Model (CSM) to provide the SCEC community with better constraints on the stress field and provide a means to formally test physical connections between observations and stress models. A web site has been developed where the community can find information about the CSM, join the mailing list, view and download many of the submitted models, view comparisons between submitted models, and obtain information about how to submit models and data (http://sceczero.usc.edu/projects/CSM). A number of crustal models derived from focal mechanism and geodetic data are currently available, and several geodynamic models are now being developed. Observations needed to contain and or validate the stress models are either available on the web site or are currently being compiled. This includes borehole measurements from the World Stress Map, industry borehole data, and compilations of seismic anisotropy. Becker and Parsons began their effort to impose mantle tractions from global mantle circulation computations with regional resolution of ~20 km on a California-scale crustal model with lateral heterogeneities and ~5 km resolution. The goal is to understand the effects of heterogeneous rheology on vertical force transmission and the likely background stress state in southern California. Preliminary results suggest that the topographic and crustal contribution to the total differential stress field are dominant and mantle contributions are minor. Luttrell, Smith-Konter and Sandwell have investigated three different models for the CSM, each estimating a different component of stress due to a different set of physical processes with a different set of physical assumptions acting over different spatial and temporal scales. They estimate the minimum differential stress magnitude throughout southern California based on a force balance analysis between the stress state indicated by topography and gravity data and that observed in focal mechanism data. They estimate the stress field across southern California must have a differential stress magnitude of at least 60 MPa at seismogentic depth in order to maintain the stress orientation inferred from focal mechanism observations in the presence of the observed rugged topography. Using a simple homogeneous driving stress field, calculated stress due to rugged topography, and models of stress accumulation rate due to locked fault segments throughout southern California, they have identified the fault loading time on each modeled segment that best brings the simple forward model in line with the stress orientation indicated by focal mechanisms. Along the main San Andreas fault segments, this loading time is estimated to be ~4000 years, an order of magnitude larger than either the time since last rupture or the expected recurrence interval, possibly indicating incomplete crustal stress release over the timescale of a single earthquake cycle. Liz Hearn is developing a finite element (FE) deformation model of the southern California lithosphere to estimate stresses and stressing rates for the SCEC Community Stress Model, to reconcile geological and geodetic slip rates, and better understand how strain is accommodated away from known, major faults. Initial calculations have made it clear that plasticity and an alternative to the “split node” technique for modeling stress-driven slip along faults are required. These features have been implemented, and are being evaluated with test models. Fialko and Lindsey are investigating the spatial pattern of surface creep and off-fault deformation along the southern segment of the San Andreas fault using a combination of multiple interferometric synthetic aperture radar viewing geometries, survey-mode GPS occupations of a dense array crossing the fault, and numerical models. The data reveal pervasive shallow creep along the southernmost 50 km of the fault. Creep is localized on a well-defined fault trace only in the Mecca Hills and Durmid Hill areas, while elsewhere creep appears to be distributed over a 1–2 km wide zone surrounding the fault. The degree of strain localization is correlated with variations in the local fault strike. Using a two-dimensional boundary element model, Fialko and Lindsey show that stresses resulting from slip on a curved fault can promote or inhibit inelastic failure within the fault zone in a pattern matching the observations. The occurrence of shallow, localized interseismic fault creep within mature fault zones may thus be partly controlled by the local fault geometry and normal stress, with implications for models of fault zone evolution, shallow coseismic slip deficit, and geologic estimates of long-term slip rates. Figure 1. Shear wave splitting results for the San Andreas fault from Miller and Becker. SKS splits are station-averaged and shown with constant length sticks, aligned with the “fast azimuth” and colored by delay time (see color bar, yellow colors corresponding to ~2 s). Blue vectors are platemotions from Argus et al. (2011) in top plate fixed reference frames. Oblique Mercator projections aligned as indicated in the small inset overview maps. Blue lines are plate boundaries from Bird (2003). Figure 2. 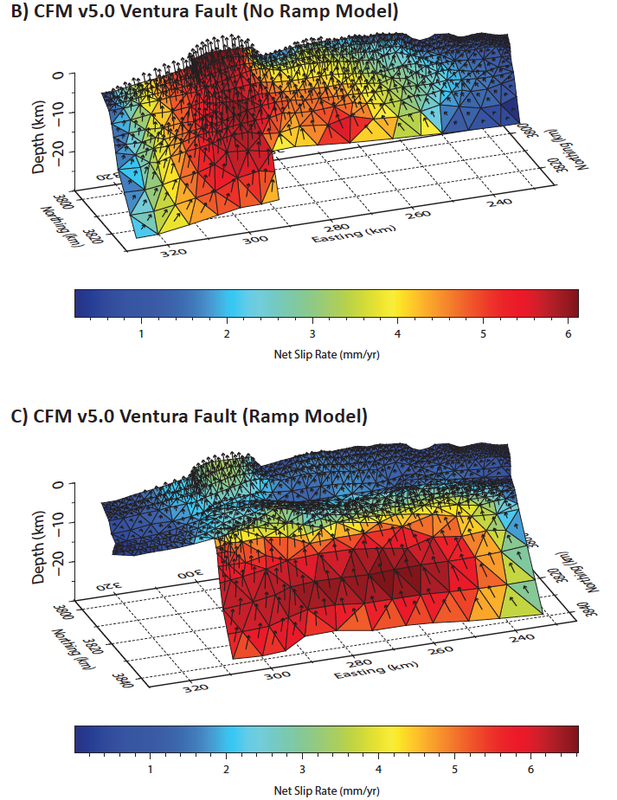 Mechanical model-predicted three dimensional slip distributions on the Ventura fault by Marshall et al. A) Not shown. B) The CFM v5.0 no ramp model. C) The CFM v5.0 ramp model. Figure 3. Results of inverting geodetic velocity field for fault slip rates in the Western Transverse Ranges by Johnson, Hammond and Burgette. a. Modeled and observed shortening rates across the region. b. Inferred reverse-slip rates on faults. Model mean and 99% confidence limit of reverse sense of slip rate is shown. Miller and Becker are working to collect disparate anisotropy data to jointly integrate them into a 3D model of anisotropy for the southern California lithosphere. SKS splitting measurements across the San Andreas fault do not show a strong signature associated with a deep extension of San Andreas fault shear into the mantle. The "fast azimuth" of SKS splits across the San Andreas fault does not show a clear deviation in orientation from the broad-wavelength mantle flow alignment. This is in contrast to the Alpine fault in New Zealand, for example, which does show a clear rotation of the SKS fast direction into alignment with the orientation of the Alpine fault. The tentative conclusion is that mantle flow does not localize in the mantle under the San Andreas fault. Marshall investigated mechanical boundary element models of slip rates across faults in the Ventura Basin/Western Transverse Range region. Large coseismic offsets have been identified in the geologic record near the Ventura fault and the associated Ventura Avenue anticline, implying a local source for ~M8 earthquakes in the past. Such large magnitude events are difficult to reconcile with the previous SCEC Community Fault Model (CFM) v4.0 discontinuous fault geometry. Recent work by Hubbard et al. provides evidence for a previously unrecognized ~80 km long and continuous fault surface extending from the San Cayetano fault through the Ventura fault and ~30 km offshore. Because of different subsurface interpretations of the fault geometry at depth [e.g. Hubbard et al., 2014; Kammerling et al., 2003], two potential Ventura fault geometries were tested by Marshall et al. Both models share the same surface trace but differ in that the Hubbard et al. or “Ramp” model contains a nearly horizontal ramp section at depth. The Kammerling et al. representation (or “No Ramp” model) utilizes a constant dip angle and merges with the Red Mountain fault at a depth of 10 km. They find that the constant dip, or “No Ramp” model, fits the geologic slip rate data best, however the differences between the slip rates from the two sets of models are small. Johnson, Hammond, and Burgette have incorporated existing and newly acquired geodetic data from the western Transverse Ranges into a regional kinematic model of present-day deformation rates across the Ventura Basin. They use a kinematic method in which a long-term horizontal and vertical velocity field is constructed assuming slip on faults in elastic plate over an inviscid fluid. The interseismic deformation field is modeled with backslip on the faults in an elastic halfspace. Using Monte Carlo Metropolis methods, they invert the geodetic data for slip rates and coupling, constrained by the upper and lower slip rate bounds in the UCERF3 geologic model. They find significant shortening across the Transverse Ranges of ~10 mm/yr. This is shortening attributed only to motion along faults in the western Transverse Ranges, after removing contributions from the San Andreas and other large strike-slip faults as well as far-field loading. The summed reverse-slip rate across the Transverse Ranges along a profile through Ventura is >15 mm/yr with 8-10 mm/yr across the Ventura Basin (Oak Ridge and Ventura Faults).